A Living and Learning Community (LLC) pairs new students with peers who have similar interests. 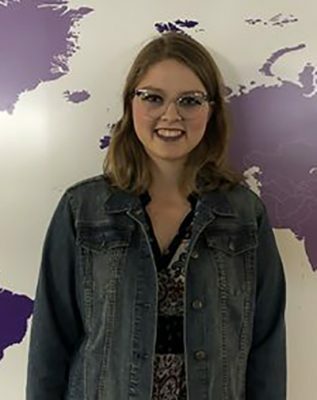 When Kayla Warren left her hometown of Payson to move onto the Grand Canyon University campus, she was filled with excitement and fear. She knew only one other person from her graduating class of 148 students who was starting classes at GCU in August 2017. Kayla Warren loved living in an LLC and now is an LLC ambassador. 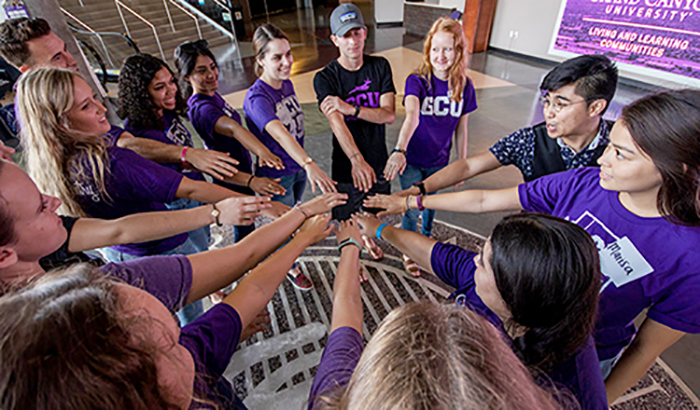 Exactly one year after her nerve-wracking arrival, Warren helped ease the transition for incoming Honors College freshmen and LLC residents at a networking event for 444 students at GCU Arena. The LLC program is designed for freshmen who prefer to share a residence hall room, suite or floor with students of similar academic interests. Along with the connections they make organically, there are organized activities in Juniper Hall, the building housing six LLC’s: Honors College; Colangelo College of Business (CCOB); College of Science, Engineering and Technology (CSET); psychology from the College of Humanities and Social Sciences (CHSS); and nursing and athletic training through the College of Nursing and Health Care Professions (CONHCP). Troy Wethe provided plenty of snacks for his presentation. Pre-med students might be in the same biology class while Honors students take “A Ripple in the Pond’’ together. Jessica Landes, a freshman from Tuttle, Okla., loves living and learning in Juniper Hall. 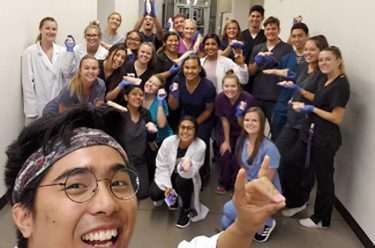 Under the direction of Luke Amargo, LLC Programming and Peer Mentorship Manager for the Honors College, there are several events in meeting rooms or the lobby of Juniper, including a suturing clinic for biology students. Jessica Landes, a freshman from Tuttle, Okla., was eager to opt into the Honors College LLC in Juniper upon her acceptance into the college. Landes shares a suite with five other Honors College students. The business management major compares notes with one suite mate who is also in CCOB. Two of her suite mates are in the College of Education, one is in forensic science and another is in sociology. As a recently hired student worker in the Honors College, Landes increasingly shares her viewpoint about what makes the Honors College and her LLC special. 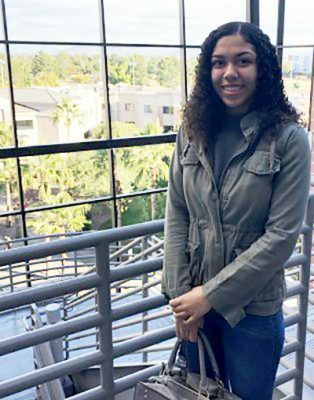 Isabella Ellec, an Honors College freshman from Corona, Calif., sought similar experiences. Nursing students await the start of an LLC program. “I was looking for communities and when I visited Grand Canyon I noticed how welcoming everyone was and how happy and encouraging. And I really liked that,’’ said Ellec, who shares living space in Juniper with a pre-pharmacy major, two English majors from the College of Humanities and Social Sciences, and two CCOB majors. A psychology major with a minor in theatre, Ellec works with her suite mates to balance academic time and social time. “We want to be able have fun and have free time, but we also take this very seriously and we want to be able to do our best, so it is finding that balance,’’ she said. Camden Bole presents at a workshop. Watching movies, baking and dining with her suite mates and floor mates spice up her time in Juniper when she is not volunteering to help victims of sexual trafficking, helping with makeup and hair for theatrical productions or tutoring younger students in her student worker job as a learning advocate (LEAD). LLC ambassadors are upper class student workers who help plan and execute the programming in the LLC’s, including inviting speakers and forming intramural sports teams. 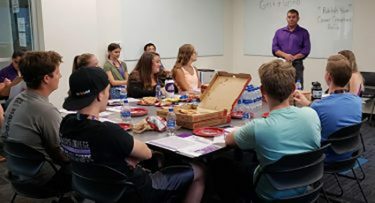 Luke Amargo, LLC Programming and Peer Mentorship Manager for the Honors College, gets his Lopes Up with LLC suturing clinic attendees. As an LLC ambassador, she calls herself a “middle man’’ between the Honors College and the students in the LLC. “We don’t work as much with the students as Life Leaders and RA’s, but our presence helps with academic resources and we program intensives, which are very helpful because students from the same college can hear from clubs and faculty members from their colleges,’’ she said. “We also help with one-on-one mentorships and group mentoring. Warren has used her LLC ambassador role to gain leadership experience. Warren is impressed by the nursing students in an LLC who made quick connections and became study partners last fall. It is part of the vibe at Juniper that she felt while living there last year as an Honors College freshman.